Can I share a secret with you guys? Just because something is labor-intenseive or 100% homemade doesn’t mean it’s the best. Making great food doesn’t have to be hard, and sometimes shortcuts are delicious. Let’s stop being martyrs here. I used to think the same way you did. I used to make everything absolutely from scratch. And there are a lot of things I only make from scratch, but if there’s a better, easier way of doing them, I ususally do that instead. 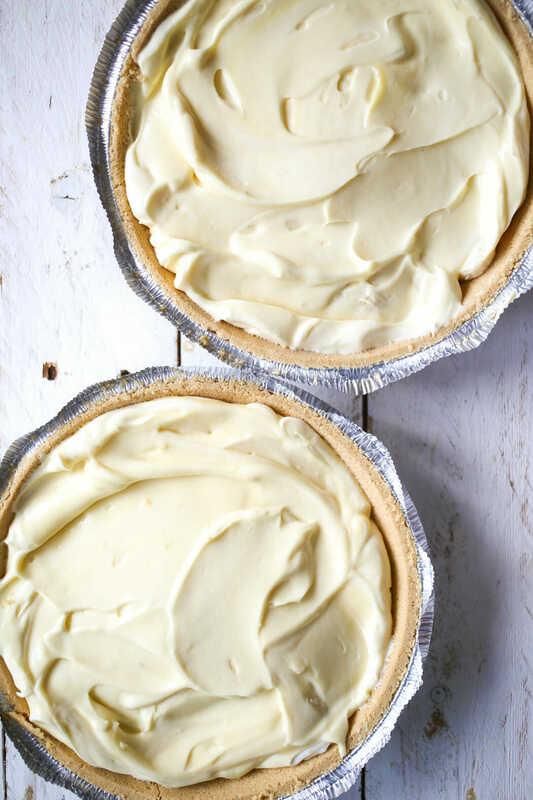 If you want to play around with flavors, that’s totally fine–I always use vanilla because I hate artificial banana flavor and the vanilla pudding will take on the banana flavors from the bananas, but you can get wild and crazy and use butterscotch, cheesecake, chocolate–wherever your pretty little brain takes you. You’re also going to need heavy whipping cream, bananas, 2 8-serving graham cracker pie crusts (you could also use chocolate or Nilla wafer if the Spirit moves you), sweetened condensed milk, and powdered sugar. Mix well and place in the refrigerator to chill for a few minutes. 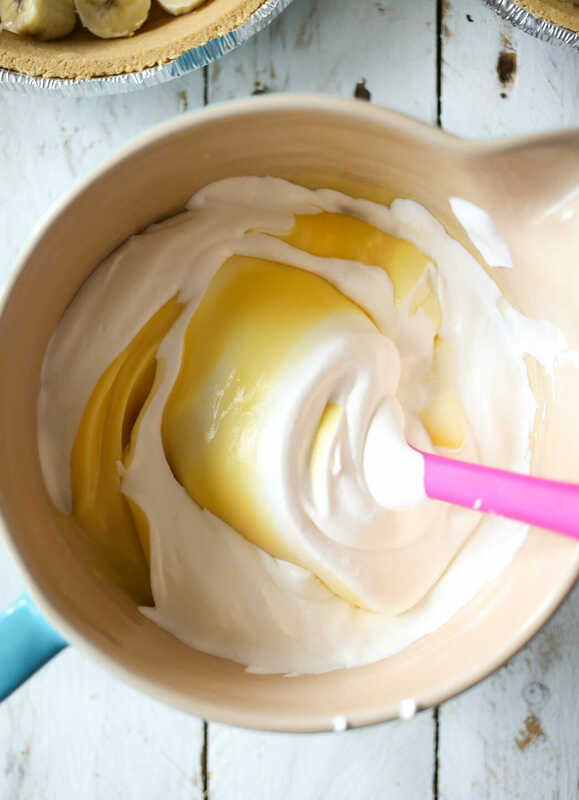 In another bowl, whip 1 cup of whipping cream until soft peaks form. Slice the bananas (probably 4-5 small bananas or 2 large bananas) and layer them on the bottom of the crusts. Be sure and save the plastic domes that come with the pie crusts–you’ll need them later! Set aside. Remove pudding from the fridge and gently dollop the whipped cream on top of the pudding. Gently fold the whipped cream into the pudding mixture until well-combined. Prepare sweetened whipped cream with the remaining whipping cream and 1/3 c. of powdered sugar and spread it on top of the two pies. Place the clear plastic shells back on the pies and allow to chill for several hours. This is actually really important–I tried eating it right away once and the pie wasn’t banana-y at all and the moisture hadn’t absorbed into the crust, so the crust just fell apart. 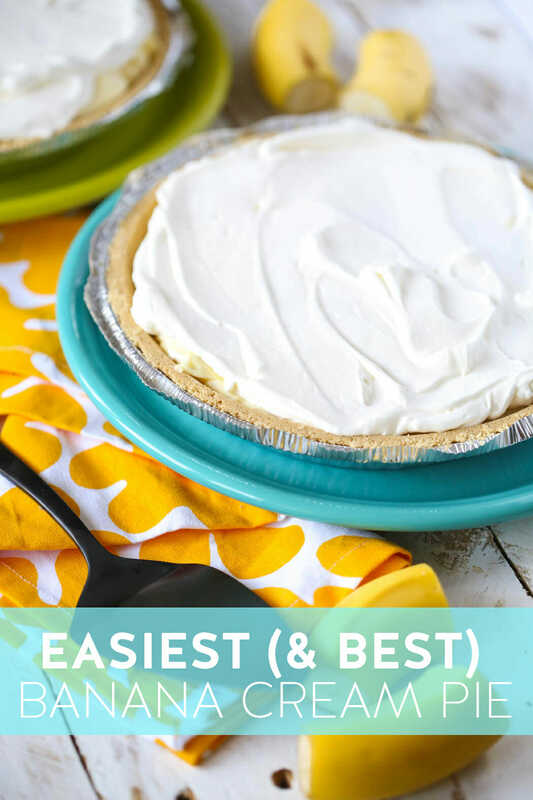 And there you have it–the best AND the easiest banana cream pie you’ll ever have or need! In a medium bowl, combine pudding mix, cold water, and sweetened condensed milk. Mix well and place in the refrigerator to chill for a few minutes. 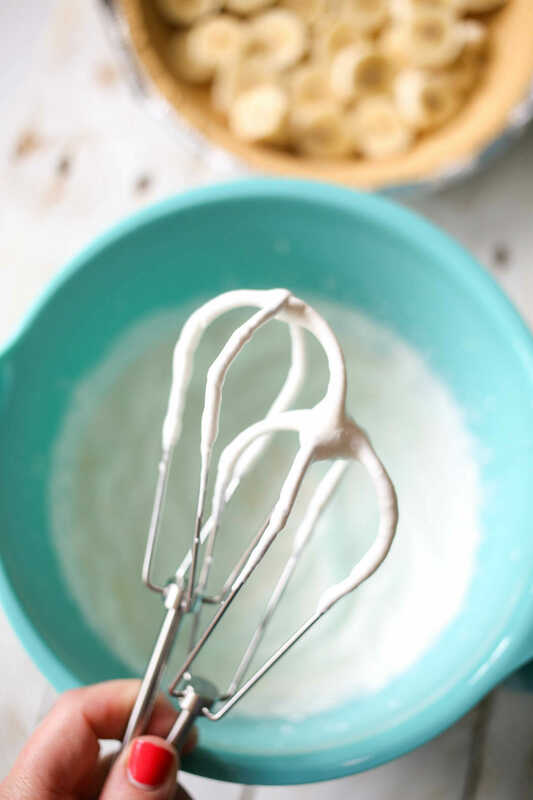 In another bowl, whip 1 cup of whipping cream with an electric mixer until soft peaks form. Slice the bananas (probably 4-5 small bananas or 2-3 large bananas) and layer them on the bottom of the crusts. Be sure and save the plastic domes that come with the pie crusts–you’ll need them later! Now divide the mixture between the two pies. Rinse the pudding bowl and beaters and set aside for later. Blend 1/2 cup creamy peanut butter into the pudding/water/sweetened condensed milk mixture (before you fold in the whipped cream). Continue as directed but place in a chocolate cookie crust. Sprinkle with honey roasted peanuts just before serving. Yes! Something I can do. . . and Oh, that pie looks delish. p.s. Does everyone have a sister-in-law named Emily? Emily, I thought the very same thing. In fact, I don’t just have one sister in law named Emily, I have THREE! Oh no! I have 5 sisters-in-law, but no Emily’s. Is that bad? I had an Uncle Bob… does that count? I think they took some of our Emily’s- because I don’t have one either, but I do have an Uncle Bob (and he’s my favorite uncle). I just stumbled upon your blog! This is Jeff B’s sister, Tara…went to HS with Eric. I hear we’re having boys around the same time. Congratulations! Do you have a personal blog? Tell Eric hi. Hey Tara! That’s awesome you’re having a baby, and Jeff too. We’ll have to get all these boys together some time. This is the only blog I have for now- keeps me busy enough! Good to hear from ya! Yum! This one makes my mouth water! Can’t wait to try it! p.s. How weird is it that I am now married to an Uncle Bob?! Wow, that’s awesome! Now…which “Wells” are you…I can’t figure it out!! i’m probably the only “ingrid” in the large and looming Wells Family. i’ll see you in 2 weeks! I made this last night (for a special occasion? No. To sit on my couch and eat? Yes:) I used vanilla pudding and put in raspberries, strawberries, and blueberries instead of the bananas and popped it in a homemade cinnamon-graham crust and it was awesome! 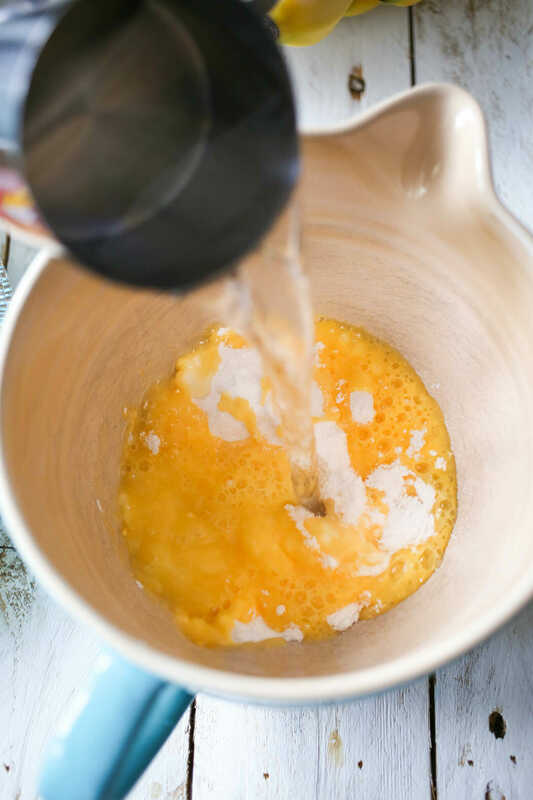 Katie– I’m stoked my recipe was good enough to make it into your blog! I know this comment is a little late, but better late than never? WOW that looks incredible – this is one of hubby's favorite desserts and now I have no excuse not to make it for him!! YUM!!!! I love banana anything! This looks so simple and yummy! Thanks!! There's nothing wrong with things being quick and easy. The banana cream pie looks great and the chunky monkey version sounds good as well. Do you think it will screw it up if I use sugar free/fat free pudding? Oh, Elesa…I don't know! 🙂 Fat free/sugar free puddings are pretty darn good, so it would probably be fine since there's so much sugar in the pie, anyway. But I've never tried it, so I can't say for sure! If you try it and it's fabulous (or not! ), let us know! I've only ever made it with fat free/sugar free, so I can tell you it works great! All of the pies pictures used the sugar free. 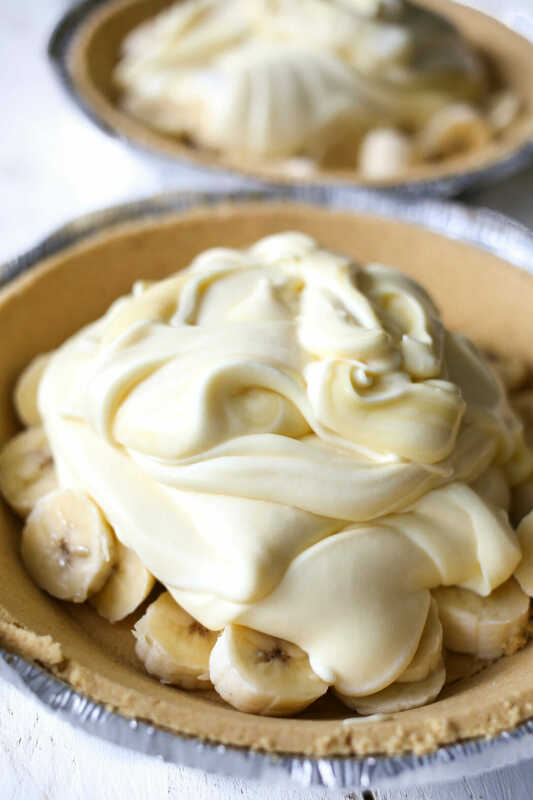 THE BEST banana cream pie I have ever eaten, more or less made! And so easy. Great recipe! I particularly loved it with the chocolate pudding. But a word to the wise: Splurge and buy Keebler crusts rather than the cheap store brand. I tried to save a bit by doing the latter and the crust was nasty! At least the filling was delish. This was really good and super easy and quick. I used french vanilla pudding, shortbread crust, topped with a few extra banana slices, and drizzled with caramel syrup. IThe caramel syrup really gave it an extra "umph"! Thanks for sharing! I don't know if anyone will see this…but could I use something else instead of Whipping the whipping cream? I live in a dorm, and I don't have a blender, but I really wanted to make my BF this for his birthday 😛 Could i use CoolWhip, or something? THanks if anyone knows! Hey, Beffy! 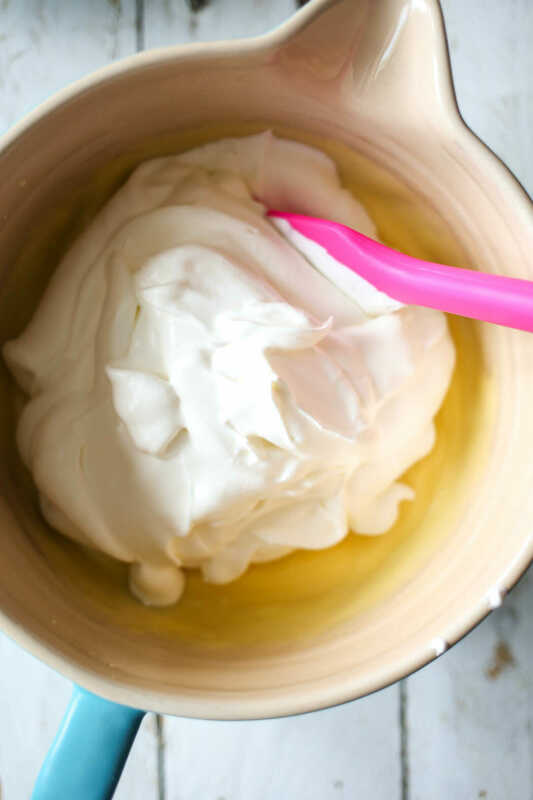 I've never tried Cool Whip, so I can't say, but it might be worth it to go and get a cheap hand mixer–like, seriously, don't spend more than $7-$10 on it. You'll use it all the time and it won't be the end of the world if it breaks or gets left behind. So is the Chunky Monkey version still have bananas? Is it the chocolate pudding with the peanut butter? Bri, yup, still has bananas (otherwise there would be no monkey, haha). You could use chocolate pudding, but I used the vanilla as called for in the recipe. I made this for Thanksgiving this year; not very traditional for Thanksgiving but it turned out great!!!! I also have stood over the stove in the past for over an hour making homemade banana cream filling but no longer. When asking the company what kind of pie they wanted everyone asked for Banana cream. I did make this in a traditional pie crust instead of graham, used a deep pie plate so only made one pie. I got compliments from the whole family. Thanks for the recipe! Lupe, no you don’t make the pudding first – just add the mix with the condensed milk and water. I meant thanks for clarifying that Patty. Just thought I would tell you that I used this pudding recipe combined with another of your recipes – the coconut strawberry lime shortcake to make trifle. I can’t believe what a hit it was at our dinner. My husband especially couldn’t stop commenting on it. I used the little coconut donuts that you can get at Walmart for the cake part, just break them up a bit; your vanilla pudding with sweetened condensed milk; the sliced strawberries mixed with lime juice and sugar; and cool whip instead of whipping my own (I was in a hurry). I just layered them all in a pretty bowl and topped it with the coconut that was left in the bottom of the donut container. The only bad part of all of this is that it disappeared so fast. If I want to make one banana cream and one chunky monkey version out of the one recipe for the filling would I still mix in 1/2 cup of creamy peanut butter? Thanks! Honestly it’s been so long since I made that, I’m trying to remember! lol I’m almost sure that was for one pie. I would start with 1/4 cup and add another 1/4 cup if it needs it! 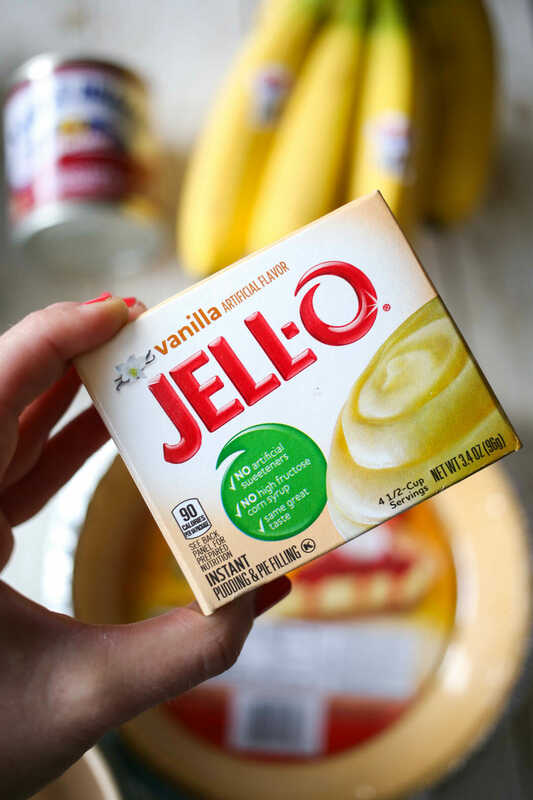 I make it basically the same way with instead Banana pudding, I’m curious now how the vanilla would taste, but afraid to loose my banana flavor, have you tried the Banana pudding instead? I made this with Banana pudding and a Nila wafer crust (I baked it so it wouldn’t get soggy), and it was the first pie to go at Thanksgiving! And that is saying a lot since my in-laws are known for their pies! Thank goodness there was 2 of them! I have also tried this with Chocolate pudding, for choco cream pie, and the cheesecake pudding for a cheesecake pie and they also come out tasty!! OMG I MADE THIS PIE.WITH FRENCH VANILLA PUDDING AND IT’S WAS AWESOME. I ALSO ADDED VANILLA EXTRACT TO THE WHOPPING CREAM AND POWDER SUGAR AND I SWEAR THUS PIE WAS JUST OUT OF THIS WORLD AMAZING .. THANK U FOR THIS EASY RECIPE.. FIRST TIME MAKING IT AND EVERYONE ENJOYED IT. My sister fed this to me tonight and in no time at all, there was absolutely no evidence of any pie on my plate. at. all. Yum-o-riffic! …now I want to try one Chunky Monkey style, and instead of adding the peanuts, add some Reese’s PB cups, roughly chopped. Oh yeah! 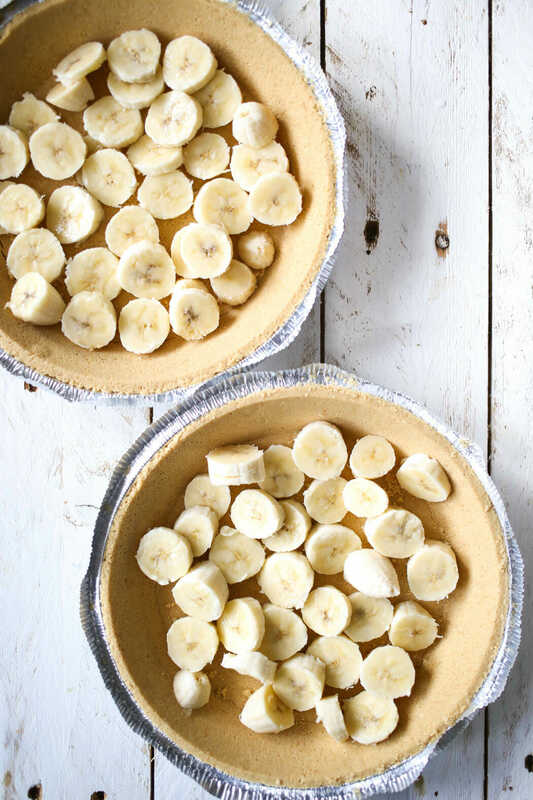 It does not take an hour of stirring over a hot stove to make a scratch Banana Cream Pie. Big Hint: Use Pillsbury Softasilk cake flour to make things smooth as silk. I am just wondering if I can use 1 cup milk instead of 1 cup water in the pudding mixture? wouldn’t the milk make it richer and more creamy? #1 I made this recipe for my boyfriend the first time I cooked a dinner for him when we were dating. He fell in love with it. The only change I made was that since I didn’t have a “pie pan” I made it in a 9×13… So I needed to figure out a crust. 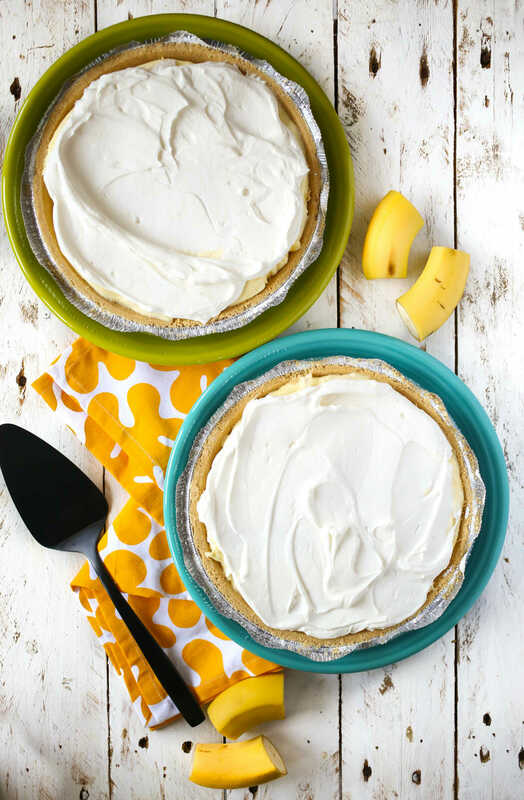 I dug in my Grandma’s old cookbooks and paired your banana cream pie filling with a macadamia nut shortbread crust… and HELLO can you say HEAVEN!! I’ve made this pie twice and followed the recipe to the T both times and BOTH times it just wouldnt set despite refrigerating overnight. THe whole pie was just so runny and I really don’t know what I did wrong. 🙁 It’s really upsetting because the cream tastes so good but it’s just like eating soup out of a graham cracker crust. WHAT AM I DOING WRONG??!?! Are you using instant pudding and not the kind you have to cook? That’s the only thing I can think of. How frustrating! oh poo you’re right. =[ I just used the pudding boxes I had sitting in my pantry without checking if it was the one you have to cook. All I checked was the flavor and serving size. Delicious! We had this tonight! Thanks for sharing all your yummy recipes! We are fans of you! How would I half this recipe to make just one pie? Please help ASAP! Just wondering wondering, how far in advance can you make this pie? We absolutely adore this pie. It’s super easy and sooo yummy! I do have one question, though… Can you freeze it? We have a small family and by the time we get through the first one, the second one is usually on the verge of yuck. I’ve never frozen it, but we’ve had readers say it was great frozen, so you could try! This was amazing & so easy to make. I highly recommend this recipe! 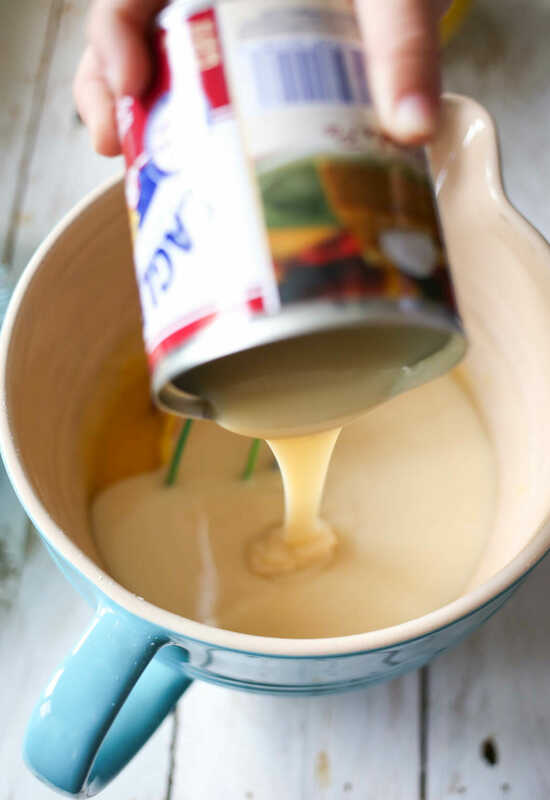 This is going to sound like a dumb question but, when you say mix the pudding mix, water & sweetened condensed milk…do you mean just mix with a spoon until the dry ingredients are incorporated or beat with a mixer like you would with normal pudding? I just accidentally used cook and serve Jell-o and its super thin! Is there anyway of salvaging this? Help please quick! I’m so glad I found your recipe! My mom died suddenly & banana cream pie was the only dessert she knew how to cook -she was truly a tomboy & never bothered with girly things including cooking. Anyway I was truly missing her & since she died while I was young, she never got to teach me to cook her recipe. I used the recipe on the pudding box but it never turned out right, but this one did! I used entire package banana pudding with 8 ounces of sweetened condensed milk (that I previously added a can of water to); with half of a pint of heavy whipping cream. No water or sugar, I was afraid of the pie becoming too sweet or soupy & it turned out nice & thick just like I hoped for. This isn’t exactly like hers but it did make me feel a bit closer to her thanks so much. Can I make this a day in advance/night before? One more question…what size pie crusts? 9″ or 10″? Can I make this on a Wednesday night and serve it on Friday? Can you make this the night before or will the bananas go brown? That was one delicious banana pie! It was a toss up between this one and the key lime pie for me. This one was definitely really good! Hi! I love this recipe and will be sharing it with the young women on Wednesday. Just wanted to let you know that the link to the sweetened whipped cream is broken! Try it with Betty Croker chocolate chip cookie as the crust, prepare as directed, divide in half, press into pie dish, bake 375 for 17-20 min, or until edges are brown. Best freaking pie ever! Someone made it for us this way, but used coconut in with the pudding instead of bananas. Didn’t know I liked coconut cream pie until then! 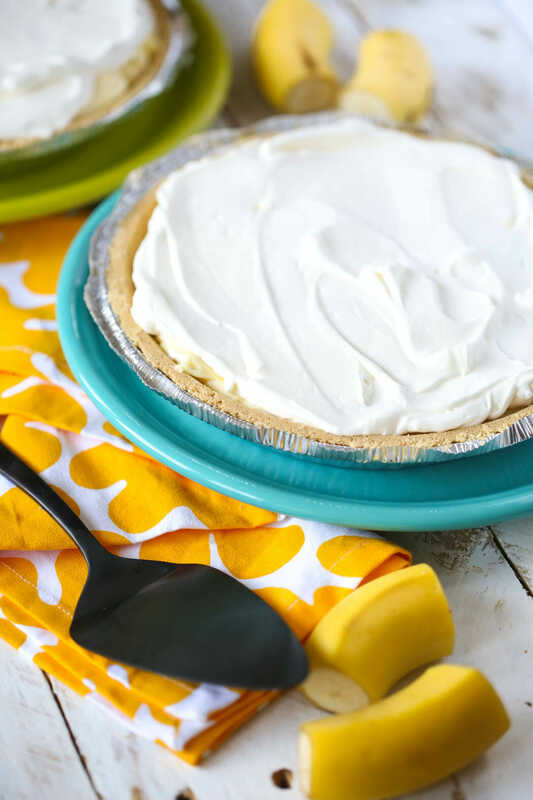 Do you know if this pie can be frozen and then thawed? 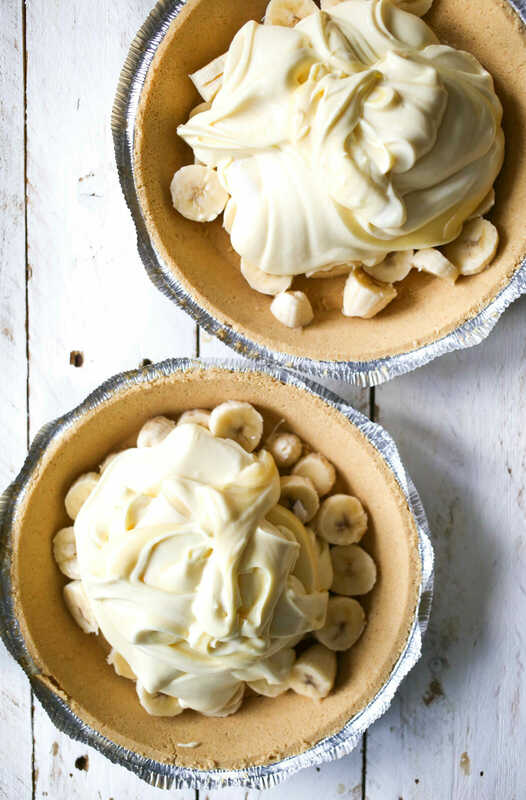 We make super easy individual banana cream pies by crushing a graham cracker in the bottom of a bowl, slicing banana on it, then a single serving of vànilla pudding cup, finish with a squirt of whipped cream. 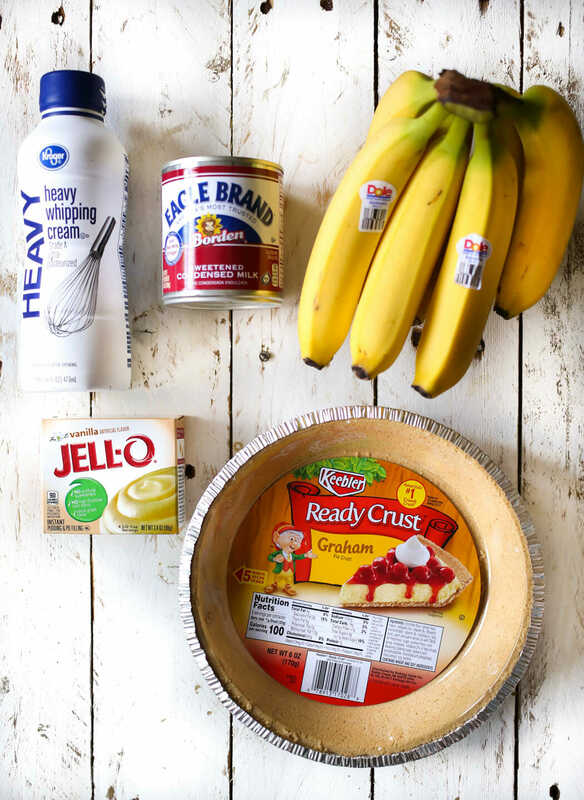 I make banana cream pie using the instant pudding (same size) and 1/3 cup milk and the rest sour cream. Bananas on the bottom also. It is delicious too!! A favorite in our family. I have never used sweetened condensed milk. Seems like it will be really rich with that and whip cream, but delicious sounding. I will have to try it. I haven’t made banana cream pie in ages! Totally making this over spring break with the kids this week! It looks so good! Looks like a great pie for upcoming hot days, thank you for sharing! Your blue batter bowl is beautiful! Where did you get it? I like to use golden Oreos to make the crust.